The earliest record of Oliver so far found is the baptism of his son in the North Devon village of Rose Ash in 1639. That would suggest a birthdate soon after 1600. The Rose Ash registers go back to 1591, so it is likely that if Oliver had been born there, his baptism would be recorded. There are no Bruers in the registers before 1639 and Oliver’s household seems to be the only one of that name. Neither his baptism nor his marriage have been found in the surrounding parishes. Despite the lack of conclusive evidence, Mark Brewer has made a strong case for Oliver being the son of John Brewer of Molland, a village five miles away. John was the son of Ambrose Bruer of Knowstone, and possibly descended from Ambrose Brewer of Brushford, just across the border in Somerset. Oliver named his eldest child Ambrose, and the name was passed down to his grandson. Ambrose is an uncommon name. No other Ambrose Brewers have been found in the generations preceding Oliver. This makes it highly likely that Oliver is a descendant of these earlier Ambroses. There is a gap in the Molland baptism and marriage registers from 1601 to 1640, just the time when we would expect Oliver to have been born. There are scattered entries for John’s family in the Bishop’s Transcripts, but not the baptism of Oliver. It was characteristic of the Brewers that sons moved away from their birth parish to found a new branch of the family elsewhere. In Oliver’s case this was Rose Ash. GRACE. There is no record yet of Oliver’s marriage. It appears not to have taken place in Rose Ash. We learn his wife’s name only at her burial. Our first definite information about the couple shows them already married and living in Rose Ash. Rose Ash is a village 6 miles south-east of South Molton, off the road to Tiverton. Its romantic name is a corruption of the original ‘Ralph Esse’. Under Henry III in the 13th century the manor was granted to Ralph de Esse. The village stands 800ft above sea level, on a prehistoric ridgeway, with extensive views to Exmoor and Dartmoor. The hill country here was another large moor and was only now being taken over as farmland to any considerable extent. Under the Tudors, Devon’s wool trade had made it one of the most prosperous counties in the country. In the 17th century this was just starting to decline. Estates were getting bigger, depriving smaller farmers of grazing land. The gap between rich and poor was widening. The lower classes suffered from both unemployment and underemployment. It may have been this new opportunity for farming, building or trade which brought Oliver to Rose Ash. 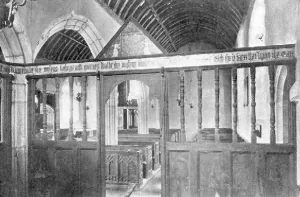 The north aisle of St Peter’s church, where their children were baptised, has a Jacobean screen dated 1618. It bears the arms of James I, his queen Anne of Denmark, and Prince Charles. But when Charles became king, loyalty to the crown was called into question. Two children were born to the Bruers in Rose Ash in the troubled years leading up to the Civil War. 1639 Ambrose the Sonne of Oliver Bruer was baptized the first day of September. In 1641, immediately before the Civil War, every male over 16 was required to sign the Protestation Oath, declaring loyalty to the Protestant religion. Oliver Bruer was one of 92 men who took the oath in Rose Ash. There were no other Bruer men in the parish. Charles I fled from London in January 1642 and fighting between Parliamentarians and Royalists began in August that year. Two months, later, the Bruers’ third child was born. Oliver himself was born too early for his name to be evidence of family sympathy with Oliver Cromwell. Generally speaking, those engaged in the wool trade, which dominated North Devon, were for Parliament. The area around South Molton was particularly fervent. Local women occupied the steps of the town cross there, with a supply of stones to brain the Royalists if they came. Conscripts to the Royalist force from South Molton and Bishops Nympton were in the lead when the men turned on their lieutenant and killed him. They had detected him as a Catholic when he did not attend church. But Rose Ash is not mentioned in the list of parishes known to be anti-Royalist. The local gentry were the Southcombs, to whom we are also related, and they were staunchly Royalist. Grace and two-year-old Mary died within days of each other in the early months of the war, while Christopher was still a baby. The closeness of their deaths suggests an infectious illness. There was a terrible epidemic of plague that year, adding to the misery of the Civil War. Mary and Grace may have been early victims of that. 1642(3) Mary the daughter of Oliver Bruer was buried the xiiiith day of ffebruary. We do not know where Oliver and Christopher died. There is a gap in the Rose Ash records for the Commonwealth period 1646-1660, when civil registrations replaced those at the parish church. One or both of them may have died during this time. Oliver may even have been a casualty of the war. His name does not appear in the Hearth Tax returns for 1664. The older son Ambrose moved to the larger town of Witheridge, where he raised a family.